The balloons fell at Wells Fargo to mark a historic night. 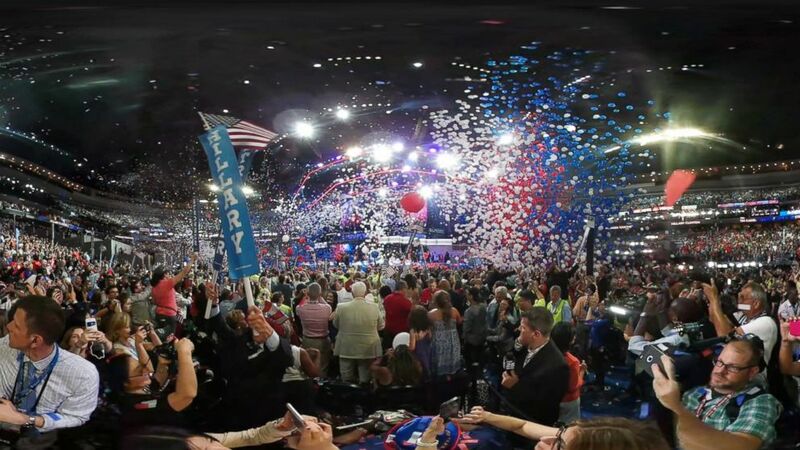 camera (Ronnie Polidoro/ABC News) Balloons and confetti blanket the Wells Fargo Center to mark the end of the 2016 Democratic National Convention. Red, white, blue and gigantic star-spotted balloons showered the convention floor of Wells Fargo arena Thursday night to usher in the historic nomination of Hillary Clinton, the first female nominee for president of any major US political party. "Today, we've reached a milestone in our nation's march toward a more perfect union: The first time that a major party has nominated a woman for President," Clinton said, accepting her party's nomination. "Standing here as my mother's daughter's, and my daughter's mother, I'm so happy this day has come." After giving the speech, VP candidate Sen. Tim Kaine joined Clinton on stage as well as her family. Clinton played with the balloons on stage, reveling in the thrill of the moment.